There are some days when you don’t want to have a big meal, but want something really light and refreshing. At the same time ,you are in no mood to eat a cold sandwich or a cold salad or even soup. For such days, I find this- grilled chicken and veggies combo, really comfy ,convenient and versatile food. 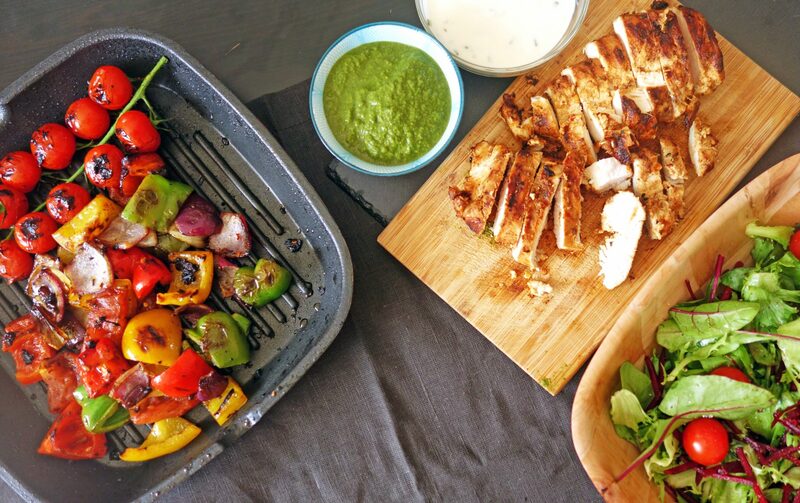 Once cooked, this can be clubbed along, with some savoury dressing, or some chutney, and you can have it as a warm salad, or as a filling of a healthy wrap/ rolls/panini, have it on a toasted bread , or even as a sandwich filling, you can simply mix the grilled veggies and chicken and have it as a side dish, or even have it as grilled veggie /chicken rice. Just brainstorm your mind, let the creativity flow, and let your heart decide, what meal you want to whip up with this healthy combo. 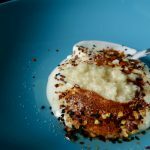 Great news is that , you can also make this a vegan option, by going meatless, and replacing the chicken with paneer (Indian cottage cheese ), tofu or halloumi. For vegans this can be a great alternative. I will share the detailed recipe of vegan option in another post. Though I have had this combination lots of time, in cafes or restaurants, but I got introduced to the home made version of this wonderful versatile combo, almost two years back, when I had visited my parents in Amritsar over a weekend. 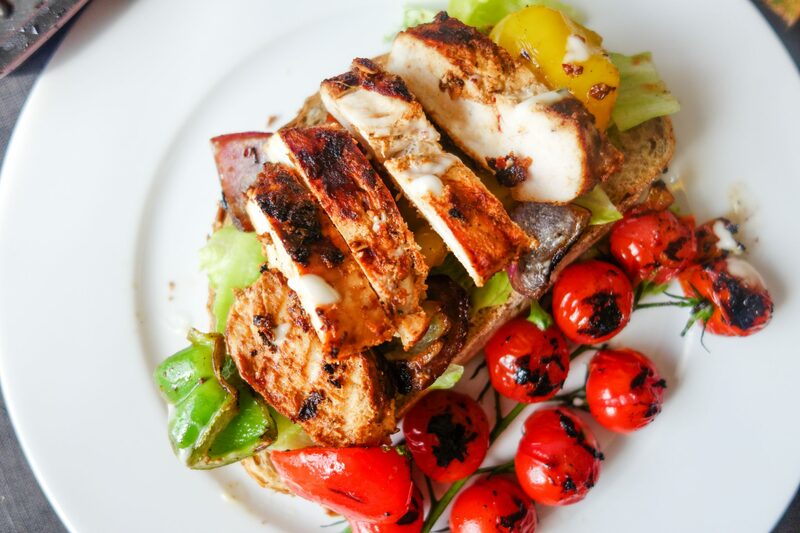 My mum had recently tried this recipe ,of grilled chicken and veggies sandwiches .Me being a big foodie, couldn’t resist , and asked her to cook the same for me. So she made these yummy grilled chicken sandwiches, and I loved it. I got the recipe from her , and added it to my recipe notebook(the one that is in all tatters now , if you remember me mentioning about this in my “About me” section). I tried making these later, and this combo was great.I played with the ingredients a bit, and experimented with this recipe. I tried making a toast, sandwich,salad, and a wrap with these. All the combinations, with a twist to the accompaniment’s, just turned out perfect. 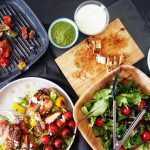 So in this post, I will be sharing the basic recipe for making the grilled chicken and veggies, so that you can use it any way that you want. Trust me ,this is superrrrr easy and quick.I usually make this on a Friday, and stock it in my fridge.As and when required on the weekends, just warm it a bit and have it. My weekend is sorted! I even sometimes add it to my pasta, or pizza toppings.Also at times, I cut the grilled chicken pieces small and add them to your my little ones packed lunch, as a snack, or add it to her sandwiches.As I said, the options to try with this combo are endless.Lets get cooking!! Authentically, this is made on a grill. If you have a grill at home, this one is a must try and will turn out to be much better on a grill.I do not have one, so I made it on the grilling pan. It did turn out nice on the pan as well. 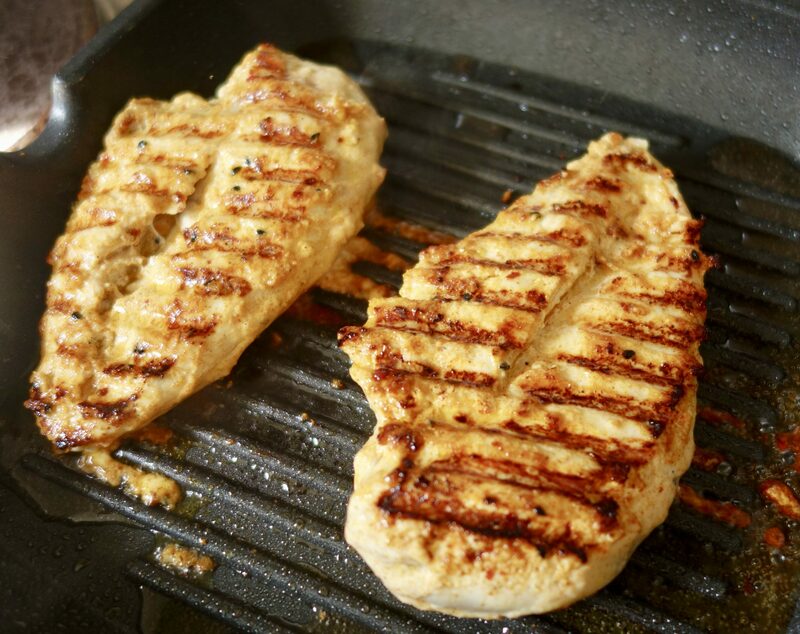 The main ingredient for the grilled chicken, is the chicken breast fillet. 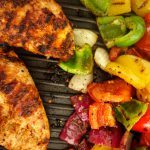 There are a few points to be kept in mind when you are grilling the chicken breasts. These are thicker on one side, and a little flat on one side. If proper care is not taken, one side can turn out to be more dry and crispy, and the other can be undercooked. Levelling them always helps in uniform cooking of the chicken breasts. To level it,pounding or butterflying are the best ways to even out the thickness and shorten your cooking time. Use a meat pounder to even out the thickness. 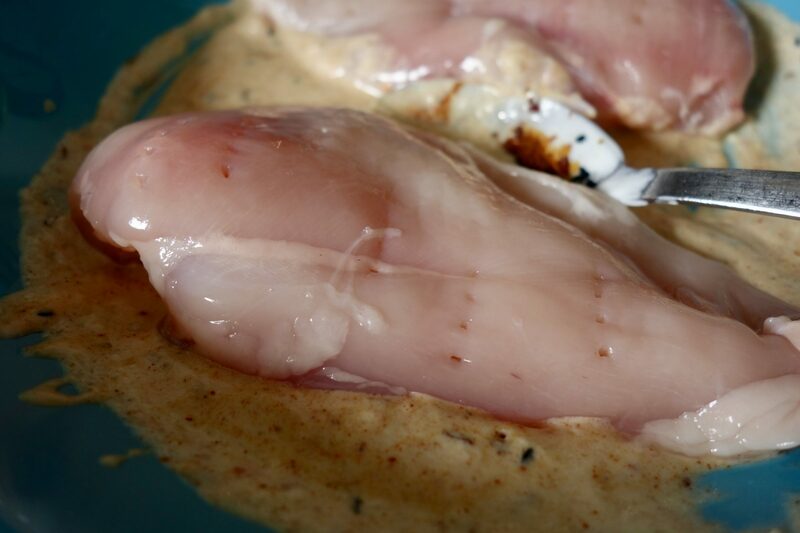 To do this dip the chicken breast lightly in water, set it in a zip pouch bag and pound gently with a meat pounder. Never pound straight down, rather pound gently down and away from you. Do not pound it too much, else it will be too flat to cook properly. This works well for chicken breast slices that are too large to pound. Using a sharp knife, make a horizontal cut from one side, nearly cutting through to the other. Open up the chicken like a book and gently pound the seam and thicker end to even it out. If you do it right, the breast will be heart shaped. 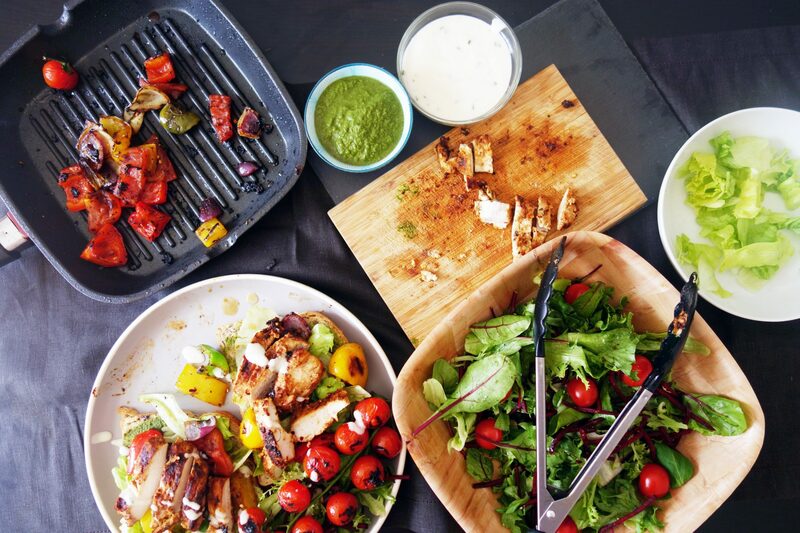 If using a griller, make sure to clean the grill and oil it a bit, else the chicken will stick to it.Chicken breast slices,should be grilled quickly over high heat for 10-12 minutes, leaving the lid open, to retain as much moisture as possible. 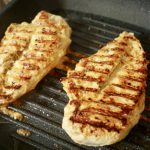 If using a grilling pan, take a clean pan, rub a little oil on it, and grill the chicken on high heat for 8-10 minutes, each side. 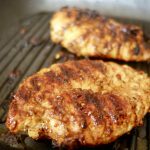 As I told you in my post above, I use boneless chicken breast slices here for making the grilled chicken. 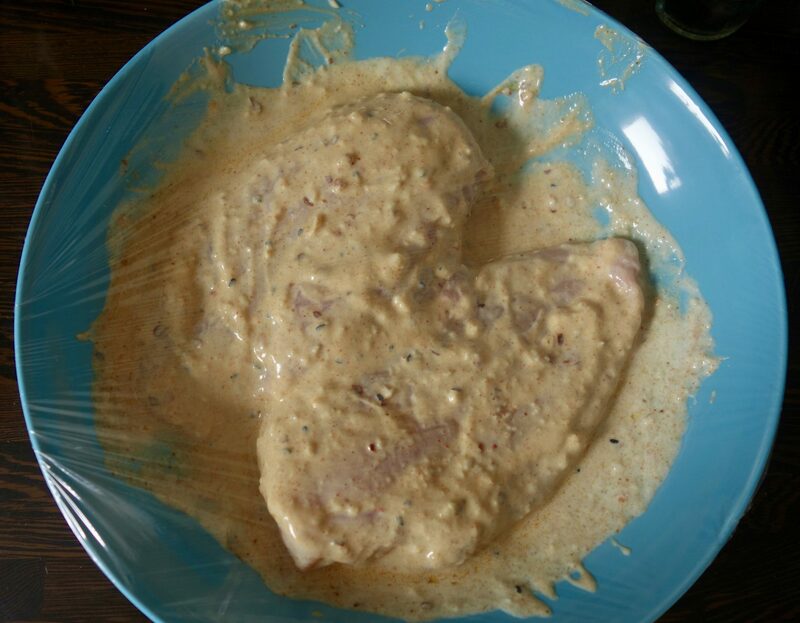 You need to marinate the chicken for a few hours, so the chicken has a nice moisture and flavour to it. 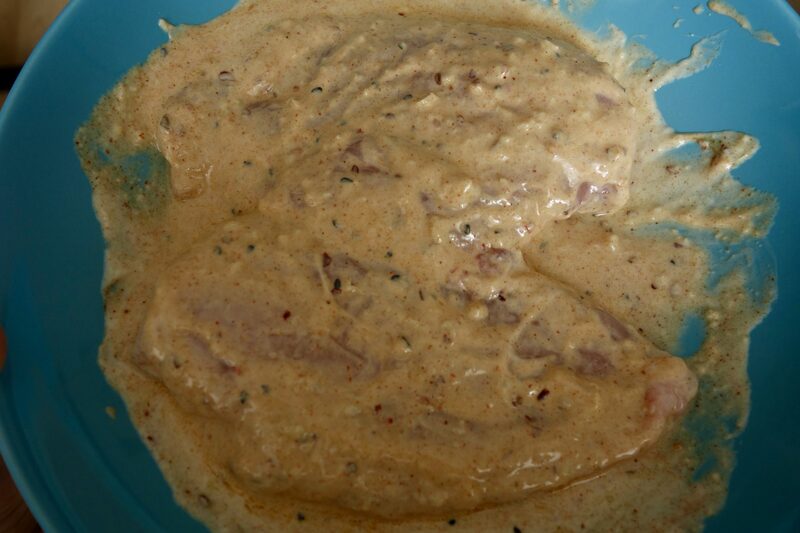 To prepare the marinade, you would need -yoghurt (use home made curd which is always present in our refrigerators in India, or else in UK, I use Yeo valley organic greek yoghurt),garlic paste (you can make a paste of fresh garlics, or grate fresh garlic cloves, or else use the store bought garlic paste), salt,red chilli powder(use cayenne pepper powder instead), paprika powder (If not available you can use degi mirchi powder or Kashmiri chilli powder instead)- this option adds a really nice colour to the chicken,red chilli flakes, cumin powder,olive oil (or any other cooking oil), onion salt and onion seeds(these add a real nice crunch and flavour to the chicken). 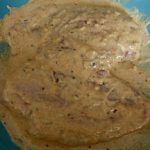 Poke the chicken randomly with a fork/ or make 2-3 long slits/slashes diagonally, so that the marinade is evenly absorbed through the chicken.Coat the chicken evenly with the marinade. 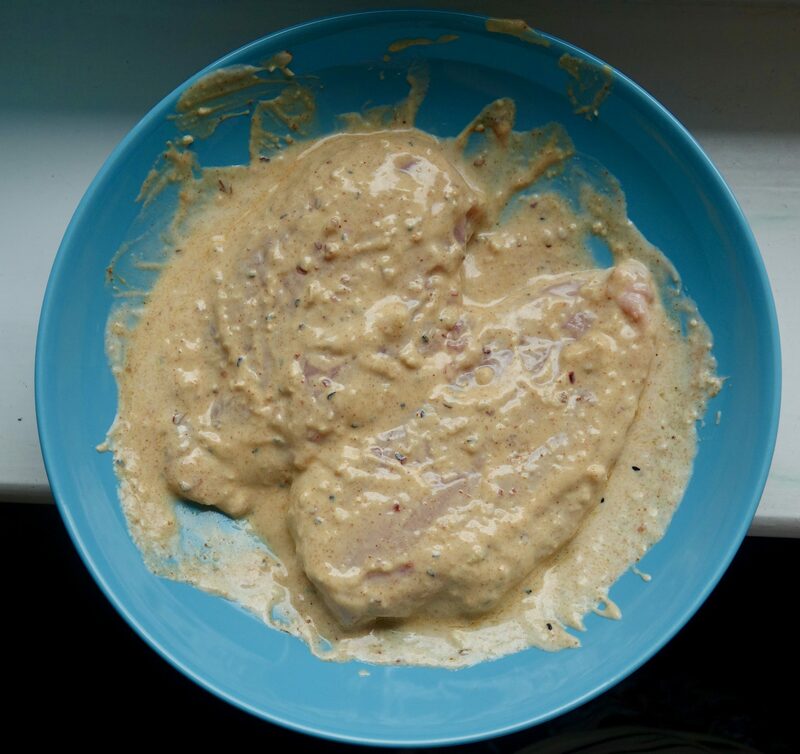 Cover the bowl with the cling film and keep in the refrigerator, to marinate for a minimum of 3-4 hours, or better still overnight ,so the chicken gets plenty of time to absorb the flavours of the marinade. Alternatively, instead of marinating the chicken in a bowl, you can pour all the ingredients in a zip pouch bag, and add chicken. Give the zip pouch a good shake. Remove as much air as possible from the zip pouch and seal it. Keep the zip pouch in the refrigerator and let the chicken get all soaked up in the marinade for the required time. 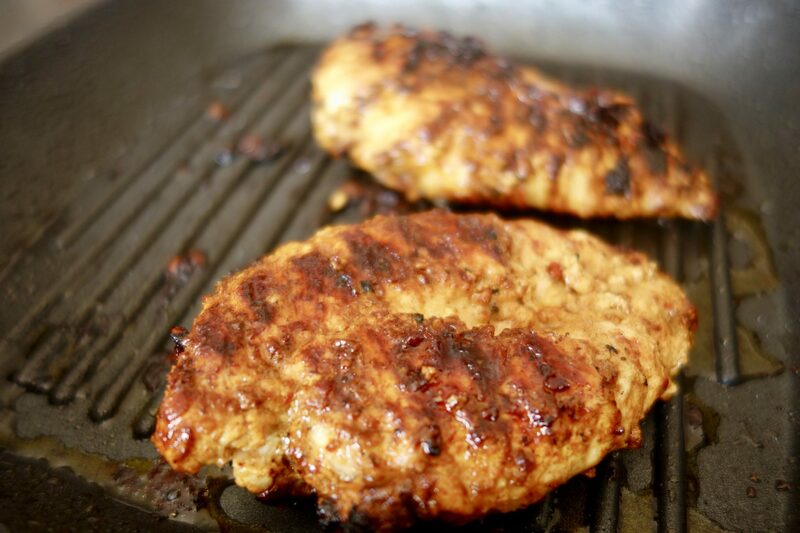 Heat some oil in a grilling pan, and add the chicken breast pieces, each side 8-10 minutes. Check the chicken is cooked before taking off the heat.To check if the chicken is cooked, cut through the thickest part of the chicken, the skin should be white and firm andÂ NOTpink, and if you press it, the juices should run clear. Once done let it cool. Cut it into diagonal slices, and use it in any of your recipes. 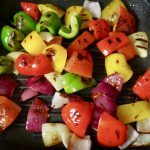 For the grilled veggies, I have used here, thick cubes of onions, green , yellow and red pepper, deseeded tomatoes cut into thick cubes . Also you can use the veggies that you prefer.You can use zuccini,broccoli and mushrooms, or other seasonal vegetables . If you are using mushrooms, I would suggest sautéing mushrooms separately, as mushrooms leave water.You can sauté mushrooms in a little oil, till they are done and then add rest of the dry spices. For the grilled veggies recipe, in a grilling pan,heat a little oil-(I used the same pan in which I grilled the chicken, so I did not add any additional oil) and saute onions for a minute, add rest of the veggies, let them heat for 2 minutes, and flip, heat it on the other side for 2 minutes. Once both sides of veggies are cooked,turn off heat. Add salt, pepper, cayenne pepper, paprika, red chilli flakes, and a little amchoor (dry mango powder).Adding amchoor is optional, but this adds a little tanginess to veggies, while still maintaining the crispiness. 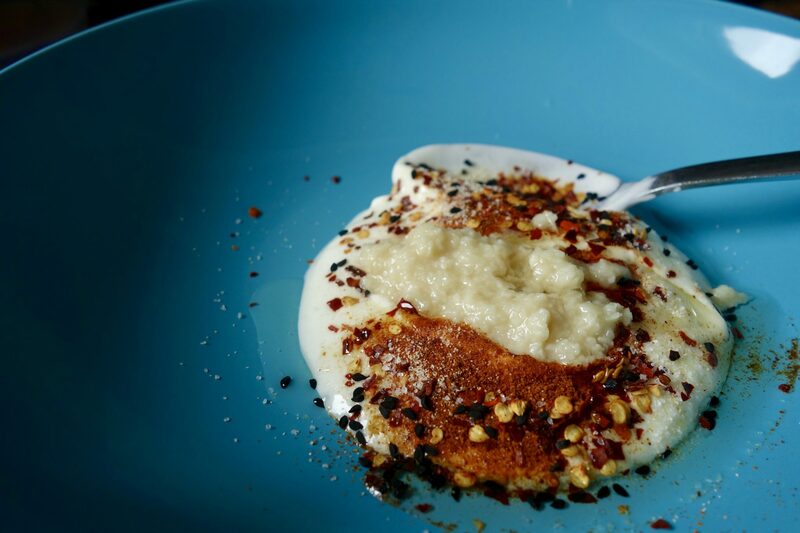 In a bowl, take yoghurt / home made curd,garlic paste, 1 tsp of oil,salt,cayenne pepper, paprika,chilli flakes, cumin powder, onion salt and onion seeds.Mix all these ingredients well. Pound the chicken, as advised in detail in my post. Poke the chicken randomly with a fork/ or make 2-3 long slits/ slashes diagonally. This helps the marinade to be absorbed evenly through the chicken. Coat the chicken evenly with the marinade. 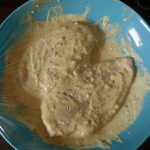 Cover the bowl with the cling film and keep in the refrigerator to marinate for a minimum of 3-4 hours, or if time permits, marinate it overnight, so the chicken gets plenty of time to absorb the flavours of the marinade. Alternatively, instead of marinating the chicken in a bowl, you can pour all the ingredients in a zip pouch bag, and add chicken. Give the zip pouch a good shake. Remove as much air as possible from the zip pouch and seal it. Keep the zip pouch in the fridge and let the chicken get all soaked up in the marinade for the required time. Heat 1 tsp oil in a grilling pan, and heat the chicken pieces, each side10-12 minutes. Check the chicken is cooked before taking off the heat. To check if the chicken is cooked, cut through the thickest part of the chicken, and the skin should be white and firm and NOT pink, and if you press it, the juices should run clear. If you are using the same pan in which you cooked the chicken ,do not add any additional oil, just add onion cubes and sauté for a minute.If not using the same pan, add 1 tsp of oil and then add onion cubes and sauce these for a minute. 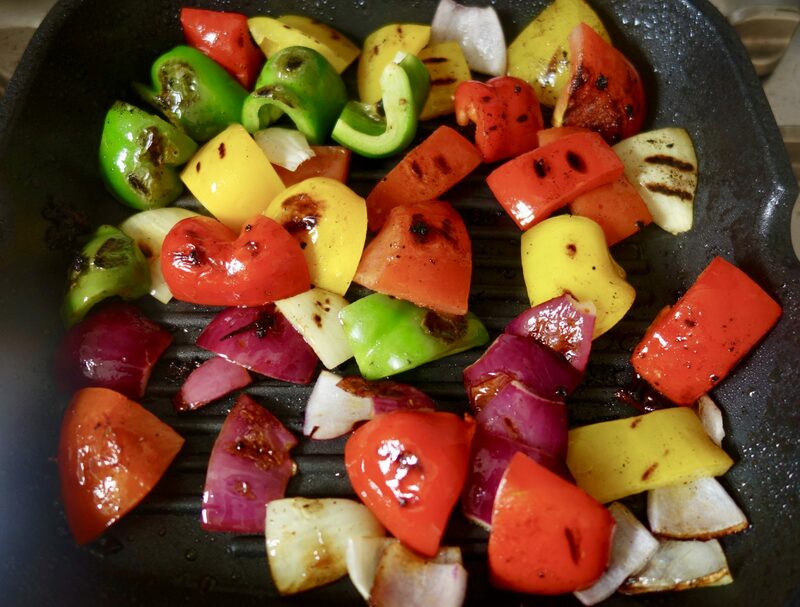 Add rest of the veggies(peppers, and tomatoes), let them heat for 2 minutes on one side, flip, and heat the other side for 2 minutes,so that they are done on both sides. Turn off heat, add salt, pepper, cayenne pepper, paprika, red chilli flakes, and a little amchoor (dry mango powder).Adding amchoor is optional, but this adds a little tanginess to veggies, while still maintaining the crispiness. Once done, serve them with chicken, and add to any of the alternatives as advised in my post, or have them as is. It is a healthy and filling combination as it is!! You can add any other veggies you like. Zuccini is a great option to add. you can also add broccoli or mushrooms. If you are using mushrooms, I would suggest sautéing mushrooms separately, as mushrooms leave water.You can sautée mushrooms in little oil, till they are done and then add rest of the dry spices.